Unemployment seems like it should be simple to define – if you’re not working, you’re unemployed. But it’s not quite that simple. How about a stay-at-home parent? Someone who’s retired? Or someone unable to work through illness? There is one single internationally accepted definition of unemployment, this is set out by International Labour Organisation and used by the Office for National Statistics. out of work, have found a job and are waiting to start it in the next two weeks. So none of the examples above are unemployed – they would be classed as inactive as they are not actively seeking work or available to start. Unemployment rates don’t count the inactive people as they’re not deemed to be in the labour market. So the unemployment rate is the number of unemployed people divided by the number of unemployed and employed people. Youth unemployment is simply the unemployment rate as described above but for the population aged 16-24. However, the international convention for the age range tends to be 15-24. However, there is one more measure of young people’s engagement with the labour market, which is slightly different to youth unemployment. This is the so called NEET rate, or those who are not in education, employment or training. This measure includes those who are economically inactive if they’re not in education. So, going back to our original examples, young people who are NEET because they are a parent are included in the this definition. Again, this measure is an internationally accepted definition, which is important because we want to make useful comparisons between youth unemployment in the UK and other countries. What’s the picture in the UK? The unemployment rate for young people (age 15-24) in the UK is 19.4% - so nearly one in five economically active 15-24 year olds is unemployed. The unemployment rate for the 25s and over is 5.0% - so one in twenty economically active 25-64 year olds is unemployed. The chart below shows how this compares with selected EU countries and the Euro area. So how does the UK compare with other countries? Using the unemployment rates above, you can calculate a ratio between adult and youth unemployment. 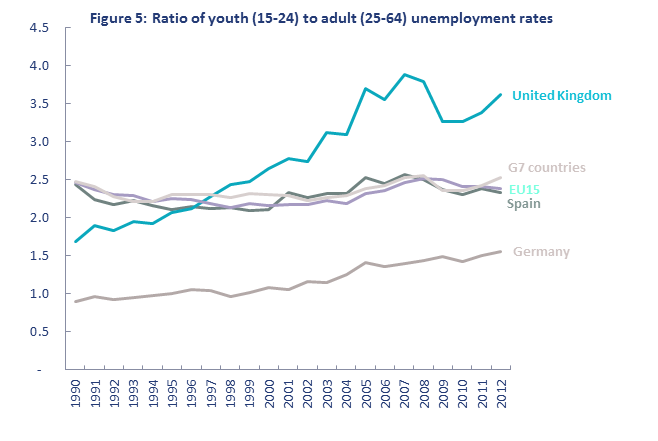 Using this calculation, the UK has had a ratio of unemployment rates between young people and adults higher than the G7 average, EU15, Spain, and Germany since 1997 – predating not only the 2008 financial crisis but also the recession prior to that. How do you get into the job market when you're the one furthest from it?